Enterprise Content Management Enterprise Content Management with DocuWare means considerably more than archiving and managing documents electronically. ECM is an information system deeply integrated into a company's IT infrastructure which automates and universally networks document-intensive processes. DocuWare is the comprehensive, complete solution for securely archiving business documents of all types, making them available in a flexible way, and using them efficiently. Regardless of the format and source, the ECM automates business processes and workflows by managing and linking documents electronically. The basis for this is the structured storage of documents in a central document pool. 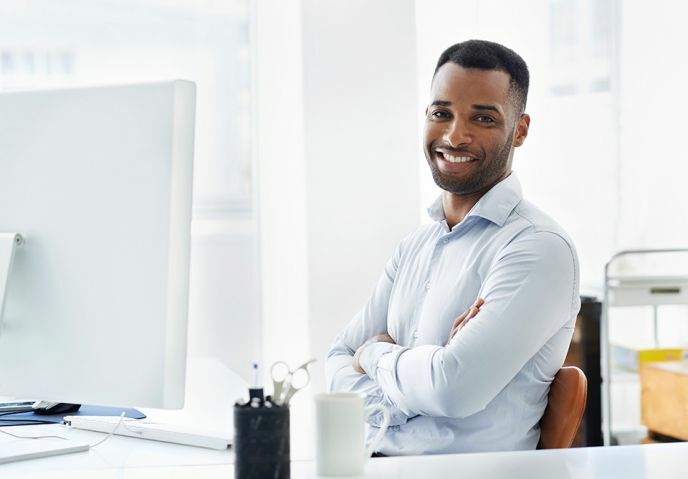 Every employee with the necessary authorization has access to all information needed for their work – regardless of whether they are at their PC in the office or on their smartphone when on the move. 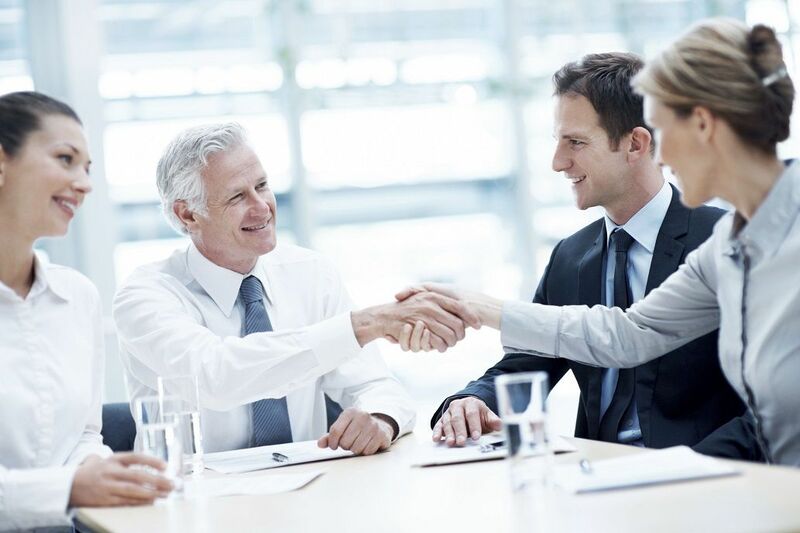 All interrelated documents concerning a customer, a project, or a business process are available within a few seconds. DocuWare is based on a normal office environment and familiar working procedures. Documents can be collected, sorted, and edited in digital document trays. From the document trays, or optionally directly - and fully automatically - the documents can be stored in digital file cabinets. High-performance index functions ensure that every document is correctly filed and categorized. In the search area you will find archived documents systematically and quickly. For example, if you as a supplier need all of the information for processing an order, enter the customer name and project and you will see the offer, order, all correspondence, and invoice in a clear result list. Documents currently available for processing automatically appear in your lists or tasks and can be immediately checked or released. 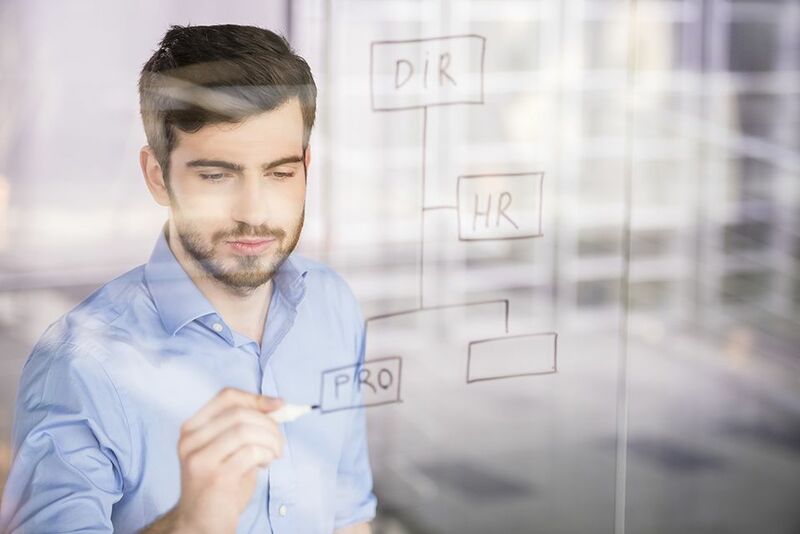 Precisely defined workflows are the basis for this: They steer documents electronically to the responsible employees for viewing or controlling. 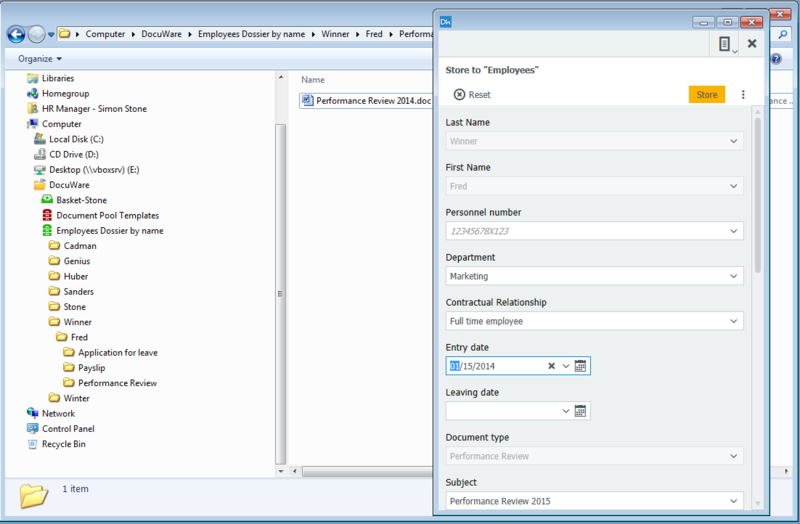 In the DocuWare Client Viewer, you can display documents independently of the respective original program. There are digital writing tools and stamps for editing, checking, and releasing documents. You can staple, clip, and sort documents; handwritten notes and signatures can be integrated using the pen function on compatible devices. DocuWare Client can be easily opened in the browser. Users benefit from intuitive guidance, in the same way they are accustomed to from other Internet applications. Also there are separate apps for mobile devices. With DocuWare you can archive documents of every type and origin in the central document pool. Documents are indexed, i.e., provided with classification data when they are stored so that you can quickly find all of your information later. This classification data can be taken from select lists, for example, or simply assigned by clicking on the corresponding terms in the document. Additionally, DocuWare's patent-pending Intelligent Indexing Service provides automatic indexing in document capture. Intelligent Indexing reads relevant index entries from the documents and suggests them for systematic storage. The service learns from you when you confirm or correct them. By the second or third time after you or a coworker has stored a similar document, Intelligent Indexing automatically assigns all entries correctly. DocuWare also offers various methods of automatically or semi-automatically integrating index data from external sources such as text files, databases, and address books, which ensures fast and correct indexing. Letters, invoices, reports, drawings, and even handwritten documents can be imported using nearly all types of scanners – from small workplace scanners to large multifunction printers in networks. Depending on the setting, the documents are kept in a DocuWare document tray after scanning for further processing and storage in the file cabinet – indexing then takes place automatically with Intelligent Indexing. Alternatively, the text and barcode identification data can be read out directly from the document even during scanning. This data is then used in document archiving as index entries, so that direct, automatic archiving into the file cabinet is also possible. Regardless of whether they are MS Office, CAD, or other files, DocuWare provides several import options. You can access the DocuWare document trays by dragging and dropping. DocuWare can also independently monitor a folder in the file directory in order to import large volumes of files into document trays automatically or import them directly into file cabinets. In addition to DocuWare Client in the browser, there is also "Windows Explorer Client," an integration of DocuWare directly in Windows Explorer. Here a DocuWare folder is shown within the data directory which contains the DocuWare file cabinets. Documents or whole directories can be filed from Windows Explorer by dragging and dropping them into it. Each file is automatically indexed here. The integration also makes it possible to archive documents directly from Windows applications using the "Save As" command. Independently of the client used, DocuWare imports files in the original format. The files are opened in the universal DocuWare Viewer for display; for editing they are opened in the editing program suitable for the file. With the universal DocuWare Printer, documents can be imported into DocuWare from nearly every application using the Print command. 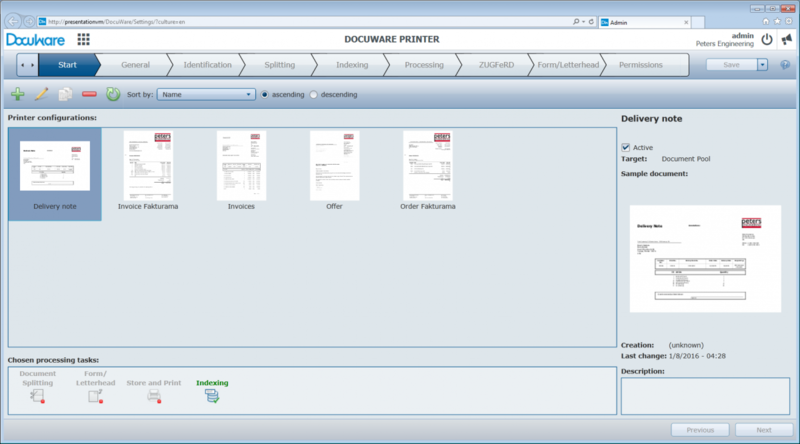 To do this, simply select DocuWare Printer from the "Print" dialog box of the application. During printing it creates an exact copy of the document and stores it as PDF/A, a special long-term archiving format, in your digital document tray or directly in a file cabinet. 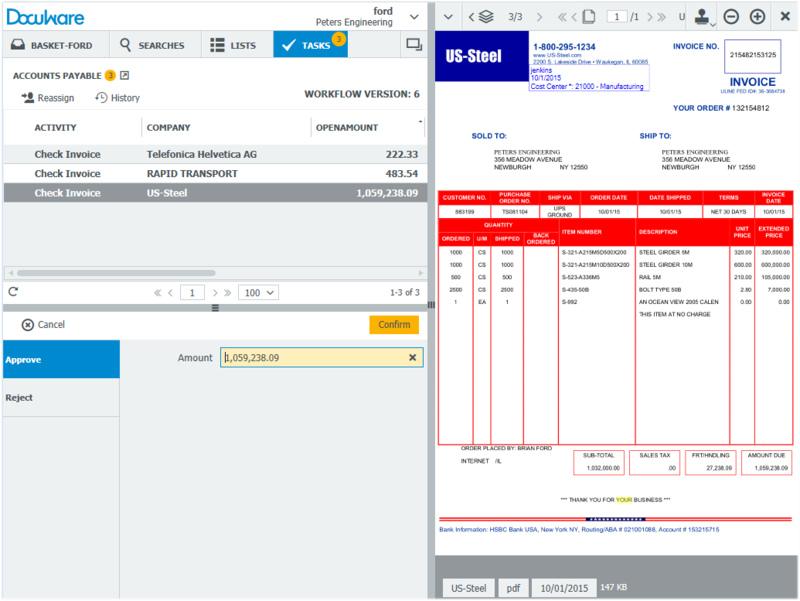 For standard documents, such as outgoing invoices, offers, or cost estimates, index entries are read directly from the document and the documents are archived fully automatically. Archiving email centrally and together with other document types on the same topic and sorted according to the same criteria takes no effort. DocuWare can import and store email from Microsoft Outlook/Exchange and IMAP email providers automatically or upon confirmation or correction by the user. The ECM uses the sender, receiver, date, subject, and other email information for automatic indexing and even supplements company and personal data from address books and other databases. Archived email are automatically marked as email. They can be answered or forwarded directly from DocuWare in the local email application, such as Microsoft Outlook. Documents should not get lost, sensitive information must be retained, and statutory or industry-specific storage and documentation obligations must be fulfilled. DocuWare protects you against unauthorized access, data loss, and system failure and ensures that your company has no downtimes, even in disasters such as fire or floods. Documents can be easily replicated and saved on data carriers outside of your company or in the cloud. Access to documents is reliably controlled through a detailed authorization concept consisting of groups, roles and profiles. This concept ensures that employees, auditors, customers and suppliers will only see the documents they are allowed to see by their level of authorization. Direct access to document files through the file browser of the operating system is not possible. Log features also make it possible to verify which user accessed or modified a document and when, even years later. DocuWare file cabinets store documents throughout their life cycle: from the moment they are imported or created, through editing and processing to long-term archiving. All current storage technologies are supported: from hard disks or RAID systems through Content Addressed Storage (CAS), all the way to Storage Area Network (SAN) solutions. The document file is saved in the original format or as a PDF/A file. A "metafile" in XML format is saved for each document file. This is used to record information about the document and its contents and contains comments and stamps, and a copy of the categorization and index data of the document for security. The main storage location for index data is an SQL database linked to the document files. This ensures that all documents can be retrieved quickly and easily and enriched with a fulltext index if required. DocuWare has extensive security mechanisms for audit-proof archiving. These protect documents in the entire workflow, from import through to long-term archiving on read-only media and storage systems. DocuWare meets the relevant legal and regulatory standards including AO and GoDB. It automatically monitors storage and deletion periods. DocuWare ensures that data which may be needed for legal reasons can be accessed throughout the entire statutory retention period by means of export functions. DocuWare makes it easy for you to find the information you're looking for. Search terms can be entered in full, in part, in combination or selected from select lists. The results are available directly in a list that you can sort as you wish. Thanks to the universal DocuWare Viewer, it is not essential to install the original application on the computer. For every file cabinet different search and storage dialogs, and results lists can be defined, as well as setting display fields. The different dialogs can then be assigned to individual users or roles. Every user therefore has the user interface to best execute their specific tasks with DocuWare. Short, clear dialogs make work easier for everyone. Search terms do not necessarily have to refer to the documents' index entries. The text of documents can also be searched. To do this, a fulltext index for the documents is automatically created in the file cabinet in the background. The function reads terms from scanned documents and the most common file formats. 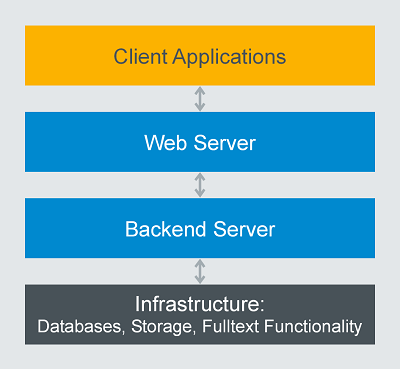 The powerful fulltext index can be combined with all supported database systems. Abbreviations and several search terms are permitted for the fulltext search. 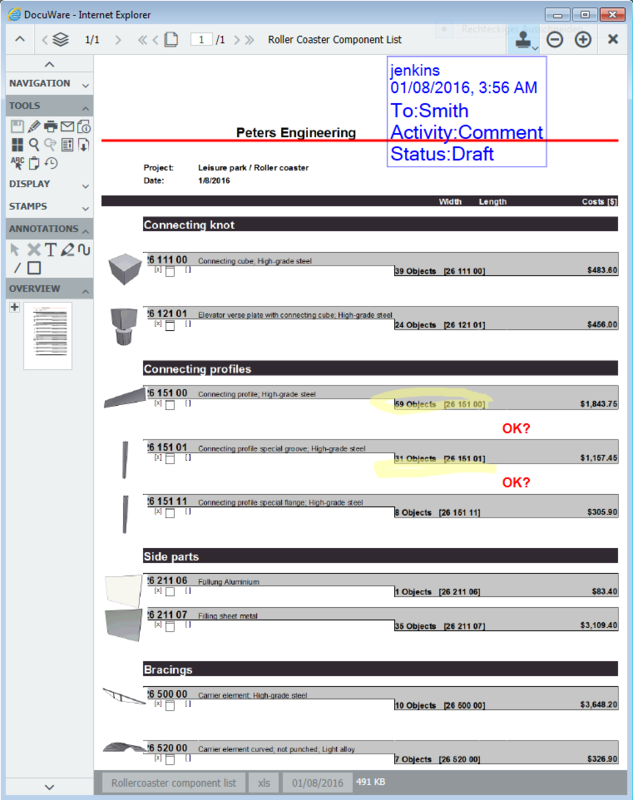 The occurrences are marked in color when displaying a found document in the DocuWare Viewer. It is also particularly efficient to integrate DocuWare search queries into other programs which you use frequently. This can be implemented simply with DocuWare Smart Connect: Every user can show special search fields in their familiar applications using easy-to-create configurations. Clicking on the field immediately delivers the exact document(s) from the DocuWare file cabinet which belong to a process and are necessary for further work. Documents in a company are rarely only relevant for just one person. It is important that documents are available centrally, that coworkers can flexibly access current information at anytime, and that the status of each document is always transparent. DocuWare offers numerous functions to organize workflows efficiently and easily integrate coworkers in document processing. Simply save a result list to always have current documents for a frequently used search readily available. Automatic version management ensures that all employees can always access the current version of a document. With DocuWare you can edit your documents in two ways: In the Viewer you can apply comments, text markers, or stamps to nearly all document formats. Here the documents themselves are not changed, as the elements are saved separately as an "overlay." You can also open documents in the respective editing program such as Word or Excel. This is done either directly in the file cabinet or after the document has been checked out. When documents are checked out, the version in the file cabinet is locked for editing by others. A new version is created when the document is checked back into the file cabinet. The previous versions are retained for checking and tracking purposes. Even in changing teams or inter-group projects, DocuWare helps you carry out your work easily and transparently. In just a few clicks, lists are created which contain all current documents of a project, for example. If a new document is added, the list automatically updates for the coworkers involved. There is also an automatic email notification to make sure that absolutely everyone is in the loop. Using these lists and notifications, you can also forward documents to each particular coworker for processing. After finishing their tasks they can forward the document to the next person responsible using a stamp. Even external service providers can easily be included in the process. Digital document-based workflows are not only faster, they are far more reliable than the paper-based variety. For example, when you stamp an invoice digitally, this is immediately and automatically forwarded to the next person for processing in the digital workflow. Should the responsible coworker be absent, the system automatically reacts and steers the invoice to a substitute. With a click of the mouse, documents linked to the invoice are also immediately available in order to clarify open questions and make the right decisions. For the processing of frequently recurring documents, such as incoming invoices, DocuWare offers a highly efficient model for controlling and monitoring procedures with its Workflow Manager. The tasks connected with a document move step by step from one responsible person to the next and can also be processed in parallel. All participants always have the latest status on the screen: So if a coworker approves a partial amount of the invoice, the data for everyone else is updated automatically. For every task it can be specified exactly what is to happen if a coworker is on vacation or a certain deadline has passed. Depending on the escalation level, a reminder is sent or the task is reassigned. DocuWare Workflow Manager has a graphic user interface which makes it easy for you to depict company processes digitally. 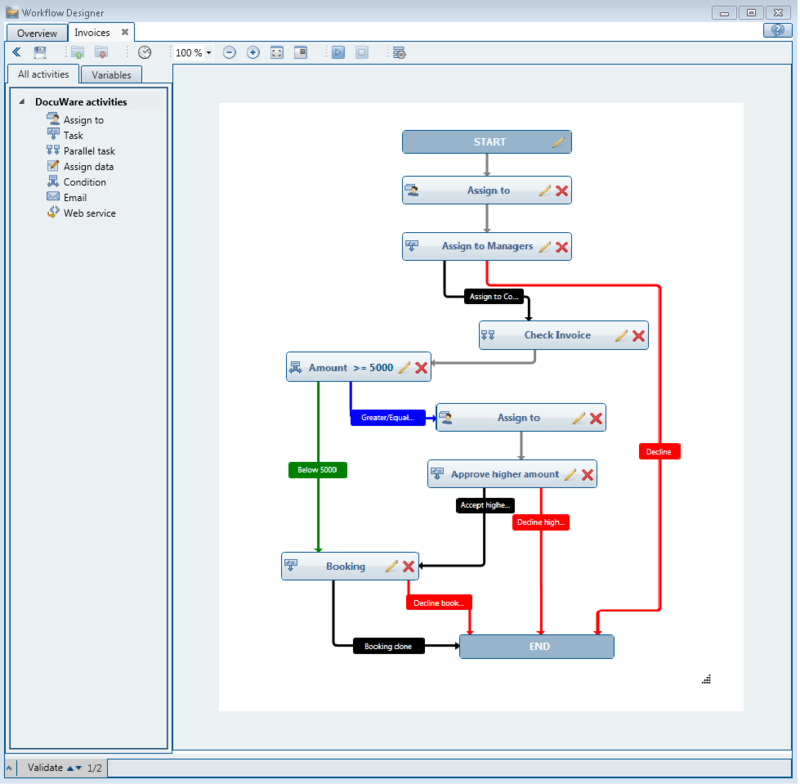 Which work step is to take place when, and what happens if a task cannot be fulfilled: In DocuWare Workflow Designer, you yourself design highly complex procedures using simple symbols and links – no programming knowledge is required. Many people have become used to accessing data and information at anytime and from anywhere using smartphones or tablets. With DocuWare this also applies for the working environment. With the DocuWare Mobile app you can also access your file cabinets from mobile devices and have the same options as in the office. Regardless of whether you're using the waiting time at the airport to approve an invoice on your smartphone, or whether you're at a customer meeting and want to see their current orders on your tablet: The DocuWare Mobile app provides you all the files you need with just a few clicks or swipes. 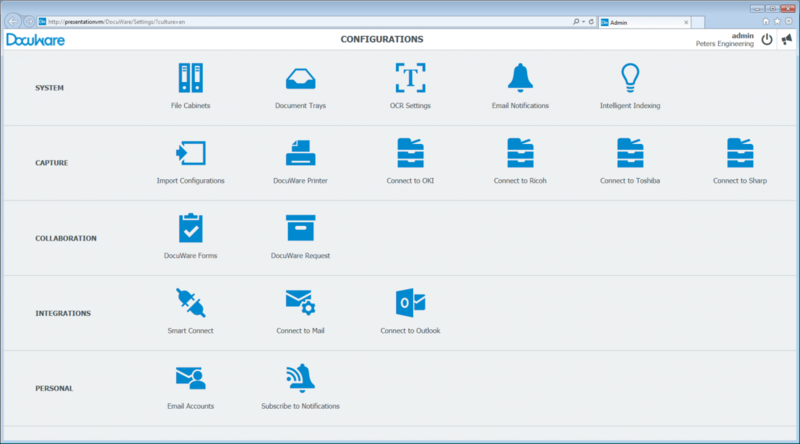 DocuWare also provides its own business apps for quickly storing new documents in DocuWare while on the move. 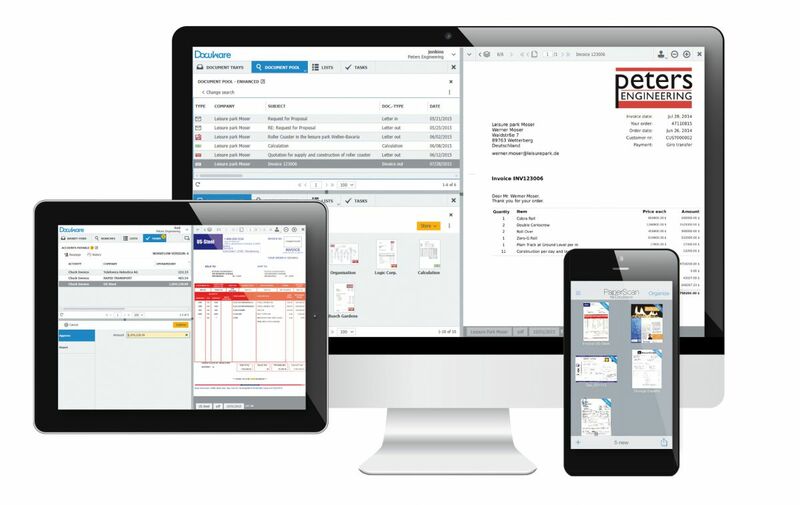 DocuWare PaperScan enables you to scan paper documents with any smartphone. The scan quality meets the highest requirements in the business world and handling is very simple: You hold the smartphone over the document, the device starts automatically; then if necessary you scan further pages, and upload the document to DocuWare. In addition, with DocuWare Hub you can send documents from any app to the document management system using the upload function. DocuWare has always stood out thanks to its very simple administration and configuration of the system regardless of how the feature set has grown, and will continue to grow. Every company has special requirements of Enterprise Content Management and wants to implement specific tasks with the system. Therefore the focus of DocuWare product development is that a DocuWare system can be configured individually. Using user-friendly web interfaces, users can create corresponding configurations for themselves and make them available to coworkers or whole departments. For example, these configurations can be used to define the import and indexing of scanned documents, email archiving, call-up of documents in DocuWare from third-party applications, and much more. You can find direct support and instructions in our extensive video collection, our product blog, and the DocuWare Support Forum. The basic principles for a DocuWare system are set up and configured in DocuWare Administration. These include DocuWare servers, database connections, storage locations for documents, and logging, for example. System administrators appreciate the simple management of the system in DocuWare Administration, where all details can be defined with a few clicks. 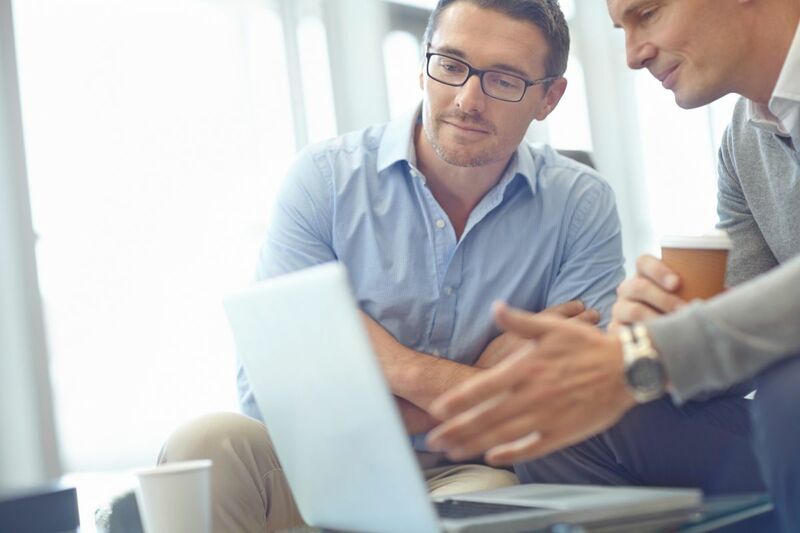 Regardless of how a company grows or how areas of application change, DocuWare grows with it, without additional training costs. DocuWare software enables you either to get started with a small number of users in a department and gradually extend the system to other departments, or to cover all your bases with a comprehensive solution right away. It is very easy to maintain the constant high performance of the system, regardless of the number of users and archived documents. All document accesses and actions of the user are processed using services. In a small system, these can all run on the same server computer together with the database. For larger systems, the same services run in a multi-server environment, i.e., on several server computers. In order to distribute the load in large systems or to increase system protection, the services can also run multiple times on separate server computers within a DocuWare system. The services, the DocuWare architecture, and the technologies used always remain the same. No other ECM system has this flexibility of scaling with consistent, simple administration. If your solution has the same feature set, you can choose between DocuWare Cloud (Software-as-a-Solution) or the on-premise model. You can then simply decide which software use model corresponds to your IT concept. For DocuWare Cloud, all data and documents are encrypted in a multi-level process and securely stored in a data center. One advantage of the cloud solution is that there are no costs for additional server hardware. You also do not need to devote any effort to maintenance and operation. You automatically benefit from the latest versions and ECM innovations, and can use all additional modules at no further cost. Both the system and our specialists are available around the clock. Our flexible licensing options give you the full range of functionalities, tailored to the number of users and documents. You can add additional users or storage space at any time if required, without changing your familiar working environment. 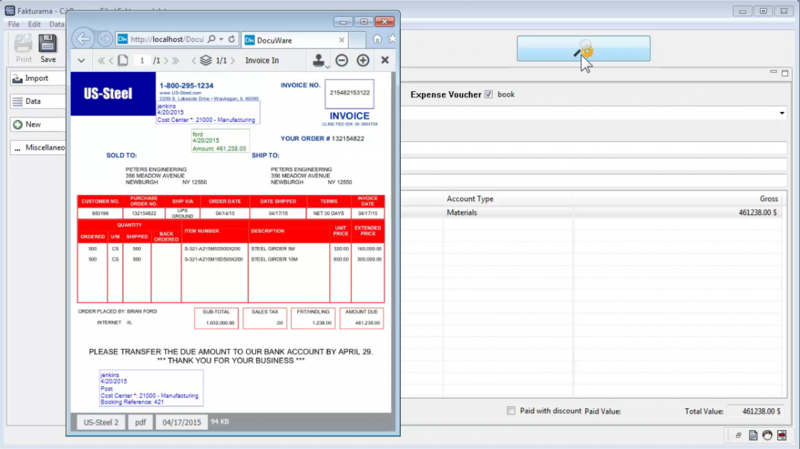 With DocuWare on-premise, you purchase licenses for servers, users, and add-on modules. Thus, you can also adjust DocuWare on-premise very flexibly to your company's requirements. The basis for every DocuWare installation is a server license. Three different server models offer a range of functions that cover requirements for various sized companies. In addition to the feature portfolio provided by the server licenses, you can individually expand the DocuWare feature set with add-on modules. For example, there are modules to integrate document management for storage and searching in other applications or to implement extremely demanding document workflows. Purchasing an additional add-on license makes the expanded feature set available to all users in an organization. Every DocuWare user needs a user license in order to log in. Employees who need to be able to work with DocuWare without restrictions each have an assigned "named" license. For occasional use, several colleagues can share "concurrent" licenses. There can be as many users logged on to the system at the same time as there are concurrent licenses. DocuWare BUSINESS Server is an entry-level solution for small companies with one server, operating on production site and with no requirement for larger file cabinets. DocuWare PROFESSIONAL Server is a flexible solution for medium-sized companies and provides one end-user organization per DocuWare system and unlimited file cabinet size. Additional modules extend the feature set. DocuWare ENTERPRISE Server is a scalable solution for large companies, supports an unlimited number of organizations within the same DocuWare system, and offers load balancing, clustering, encryption of document data, and connection to external storage solutions. Additional modules extend the feature set. Client licenses for users in a system can be purchased in the concurrent model (i.e. licensing of a number of computers connected to the system). A concurrent license can be converted to two named licenses. 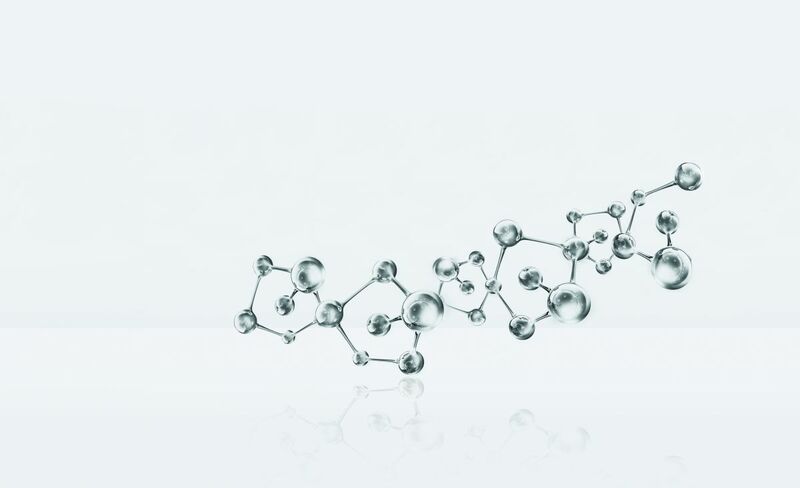 Innovation, architecture, security, integration capability, and scalability are the important technology components when selecting an ECM system. With the experience of several tens of thousands of customer projects, DocuWare has developed technologies for Enterprise Content Management which are currently world-leading. The world of IT is undergoing a rapid transformation, with new and varied types of IT devices and technologies emerging nearly every day. Against this backdrop, DocuWare uses the latest technologies in programming and creating the architecture of its document management system, and offers its customers software that will continued to meet the varied user requirements of tomorrow. The DocuWare architecture corresponds to the N-tier model and is split into four layers. To work with DocuWare you only need an Internet-capable device with a browser. The ECM system can be used across platforms, both on Windows and Mac OS devices. This is possible due to the standards-based architecture of DocuWare, which stands out with real multi-client capability and a service-oriented structure, in addition to ultra-modern interfaces for web and mobile applications. Only in a few cases are local applications needed; these are brought together in DocuWare Desktop Apps, which can easily be managed centrally. The DocuWare Client is based on HTML5 technology and therefore supports all standard browsers, even for highly complex operating scenarios. The system works with open communication standards and uses HTTP/HTTPS between components, mostly together with either REST (Representational State Transfer) or SOAP (Simple Object Access Protocol). DocuWare’s mobile applications are both available for iOS and Android, thus running on all major platforms. For a DocuWare installation, the newest Windows versions are supported. In addition, all leading database server technologies such as MS SQL, MySQL, and Oracle are supported across a multitude of versions.